A couple weekends ago I attended S.P.A.C.E. (The Small Press and Alternative Comics Expo) in beautiful Columbus, Ohio. Joining me on the trip were my friends/roommates/cable access collaborators, Tim Richardson and Brad Quinton. The goal of our journey was to sell some of my comics and to meet some very talented cartoonists. Did we succeed? Well, I guess you'll have to read the following to find out! Despite the fact that I was up fairly late stapling and assembling my bite-sized comics, I tumbled out of bed at a decent hour to tackle the tasks that needed to get done before departing for Columbus. After packing, I went to Ball State to pick up some comics from local screenwriter/friend John Oak Dalton. Besides being a great writer, John also creates his own comics and I offered to sell some at my table. After chatting a bit with John, I left his dank basement office with his Bad Eggs in my hands. As I walked across campus, I encountered the enigmatic Happy Friday Man. Riding his scooter with his blue cape flapping in the wind, Happy Friday Man bellowed out "Happy Friday!" as he whizzed by and then he disappeared amongst a crowd of co-eds. I nearly considered him a good omen for our trip, but then I realized I didn't really believe in omens, good or otherwise. However, I did believe in Happy Fridays so I took his words to heart. to Columbus is fairly easy. Basically it involves staying on I-70 for a couple hours and then you're there. at The Laughing Ogre, a great comic book store that seemed to have everything a comic book lover's heart desires. We had a little trouble finding the Ogre, but we eventually made it. all of the current releases, and some small press comics as well. It was the type of store I could easily fall in love with. The crowd at the get-together was large, but the store didn't feel crowded. Though I saw a couple of familiar faces among the attendees, I mainly kept to myself due to my darn shyness. Fortunately, Tim and Brad don't have that problem so they met and talked to some interesting people while I kept gawking at all the Ogre's swag. We stayed for about an hour. We ate some free pizza, we drunk some free drinks, we bought a few books, and then we were off once again. We stopped at a Steak'n Shake before going back to the hotel and had a pretty good meal there. Eventually, we found ourselves back in our hotel room, slightly exhausted from the trip and wondering what the next day may bring. After a few hours of restless sleep, the alarm clock went off and it was time to get ready. I was a little nervous as I headed downstairs with my box of comics, but excited as well. I signed in and quickly found my table. There were two ballrooms and my spot was in the smaller one. Accepting the fact that I really didn't know what I was doing, I started to set things up. My table was surrounded by some very talented folks. To my left was Michael Indovina (Satyr) and to my right were the people behind Icecreamlandia, Eve Englegos and Joshua E. Mountray. Just a couple tables down from me was writer and Pickle Press founder, Nik Havert. I used to work with Nik a long time ago at Munchies, a snack bar at BSU which no longer exists. Nik has been making a name for himself with his small press comics the last few years. It was great to see him again. After organizing my books in various piles, Tim came downstairs to join me. Deciding the table looked as good as it was going to get, I left Tim in charge so I could go upstairs to change into my Arlo Wazzo costume. 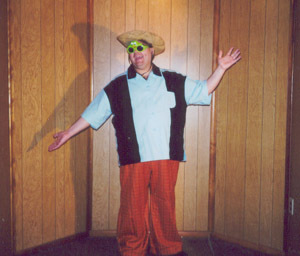 Since I had no actual display for the table, I decided I would dress up in my Wazzowear and become a living display! Of course, I ran the risk of looking like a king-sized doofus, but, if it got people to buy my comics, so be it. The show opened at 10:00am and we were ready for the onslaught of consumers. The fact that not many of them came our way didn't bother us in the least. I tried to say "Hi!" to everyone who walked past. It often didn't led to a sale, but at least I tried to be friendly and approachable. Every now and then, I left the table to purchase whatever book caught my eye and to meet some fellow cartoonists. It was so nice to finally meet Dale Martin, Larned Justin, and B. Winter in person after corresponding with them for the last couple of years. Besides being swell cartoonists, they were also great guys to talk to. I also got a chance to talk to the wonderful Pam Bliss (Paradise Valley Comics) and got a sneak peek of her newest series, Kekionga (which looks all-around cool!). In my most fanboyish moment, I had all of my issues of Street Angel signed by Angel co-creator and artist, Jim Rugg (who also was very friendly by the way!). Walking around all the tables and looking at all the comics made me wish I had enough money to buy at least one book from everyone. Sadly, I didn't so I couldn't, but I did get a decent-sized stash of comics from the show which I'm still reading my way through. Before I knew it, the show was over. It was amazing how fast those eight hours flew by. Soon we were packing things up and I was nicely surprised to see we actually made some money off my little comic books. Not that much mind you, but more than I ever expected. After changing into my normal duds, Tim, Brad, and I went back downstairs to the hotel's restaurant. 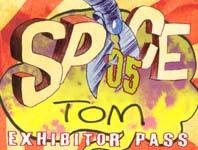 S.P.A.C.E,'s special guest Dave Sim (Cerebus) had generously bought dinner for all of the exhibitors and we graciously accepted the offer of good eats. Thank you for the chicken quesadillas, Mr. Sim! A little later Tim and Brad crashed in our room while I went up to a drawing party that Dale was throwing a couple flights up. Dale was a gracious host and I felt at home amongst the small throng of cartoonists, drawing our way in and out of various comic jams. The legendary Matt Feazell (Cynicalman) even stopped by to doodle about and it was cool to say "Hi!" to him. After drawing a few panels and talking to Dale for a bit, things soon winded down and I was saying my good byes. Heading back down to my room, I realized the party was a fitting topper to a perfectly fun day. Despite staying up way too late again and discovering the charms of Cheap Seats, we awoke up an hour before checkout time. There was some dashing about as we packed and sorted things out, but we were back on the road a little after noon. Before heading back to Muncie, we stopped at the fabulous Johnny Rockets for lunch. Tim and I discovered the charms of Johnny when we attended the Mid-Ohio Con a couple years ago and I was happy to find out my second visit there was as good as my first. Damn good food! After a belly busting meal, we began to head west. Home was just a couple of hours away. Going to S.P.A.C.E. was a great experience for me. I was able to meet some friendly people, learned some new ideas on how to sell my comics, and I was exposed to some interesting and exciting work that I never knew existed. Just being in a place full of so many creative and talented folk was inspiring to me. I definitely plan to attend next year! I just wanted to thank everybody who stopped by the table and sampled my funnies. A bigger thank you to all the people who actually bought some! Thanks to Bob Corby for putting on such a fun show and the biggest thank you of them all to Tim and Brad for coming along and helping me out with my first con. You guys are the best! Labels: John Oak Dalton, Me in Pictures, S.P.A.C.E. For the last few days, I have noticed a surprising number of green-headed mallards popping up here and there. Is that a sure sign that spring is here or does that just involve cardinals? This past Saturday was 24 Hour Comics Day and I actually participated this year. I previously attempted to do a 24 hour comic last year and failed (Though I did eventually get a decent comic out of the deal) so I was determined to actually finish one this time around! The day found me rising around nine or so in the morning. After quickly getting cleaned up, I was on the road to Anderson, Indiana where I was meeting the famous John Oak Dalton at Reader Copies, a dandy comic store that was officially hosting a 24 hour comic extravaganza. I finally arrived at the store around 11:00am. Once there, I met fellow participants Eric Dalton (John's brother) and Robert Flory, an art professor at Ball State University. Also on hand were former Touchy Feely Fotos employees, Eric and Amanda Ballenger. Eric B., a friend of Robert's, was actually filming the event as a documentary. I started work on my comic at 11:10am. I really had no idea what my story was going to be about so I just let the drawings be my guide. One of the cool things about drawing out in public was meeting and talking to some of the onlookers as they passed by our tables. Reader Copies seemed to be a major hub for gamers so most of our "audience" were curious kids. One little girl actually sat down at my table and started to draw as well. I stayed at the store until a few minutes before closing time which was 5:00pm. John actually finished his comic book a little before 4:00pm so he and Eric took off to catch Sin City while Robert finally called it a day a half hour later. I had eight pages completed when I finally left. In order to spare you the very boring details, I won't cover the next few hours blow by blow. I did almost throw in the towel around 10:00pm or so when I realized the story I was working on no longer interested me. However, before I called it quits, I decided to go into a different direction and the work progressed anew. With just a couple pages to go, I fell asleep a little after 5:00am. I awoke a couple hours before my deadline with no clue on how to wrap things up. I struggled for nearly an hour to finish my final two pages. I would start to draw something and then I would hastily erase to start again. Realizing I was wasting too much time, I dropped any concerns for perfection as I doodled a resolution to the project. I finished at 11:01am with just nine minutes to spare. So I did it! I actually completed a 24 hour comic book. It was frustrating and fun and challenging all at the same time and I'm glad I did it. Here's hoping I can do the same next year! Wow. I'm still pretty exhausted from my big S.P.A.C.E. experience this past weekend. I had a lot of fun and I actually sold some of my comics! I'm too lazy to chronicle my exploits at the moment, but expect some blather on the subject in a day or two. Yikes! S.P.A.C.E. is only days away! I'm actually going to try to sell some of my minicomics there and I still have a ton of stuff to do! I really hate being a procrastinator! The macaroni they serve at Boston Market is limp and sad. 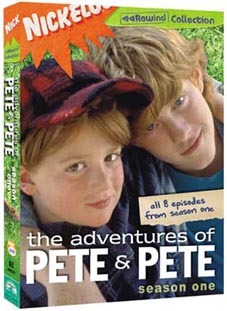 Well, those knuckleheads at Nickelodeon finally came to their senses and released The Adventures of Pete and Pete on dvd! The first season hits the streets on May 17. Excellente! WASHINGTON (Reuters) - The race is on to succeed John Paul II as pope and bookmakers are already getting in on the act. But not all the candidates are quite what they seem. According to The Washington Post on Tuesday, gamblers can back Cardinal Dionigi Tettamanzi of Italy at odds of 11 to 4. 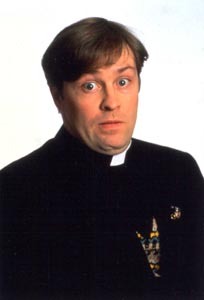 "Or they can take their chances on Father Dougal Maguire of Craggy Island, Ireland, a long shot at 1,000 to 1." But the Post's reporter was unaware of a key detail that, generous odds aside, would make canny bettors take a pass on Father Dougal. More accurately spelled McGuire, he appears in the hit British television comedy "Father Ted," which follows the antics of an eccentric group of Catholic priests on a small island off the west coast of Ireland. The clueless Dougal is described by Britain's Channel 4 television as "one of God's 'special' creatures," but even so, he is not thought likely to assume the throne of St. Peter.